Six years ago, chef Paul Kahan got back from a trip to the White House and he was all fired up. 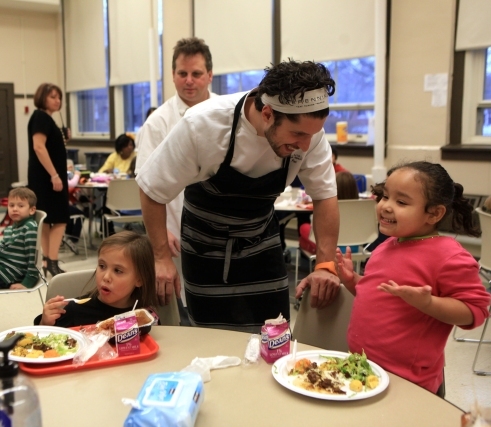 He was among several top chefs recruited by First Lady Michelle Obama to use their power and prestige to improve the nation’s health through its schools. So Kahan (whose restaurants include Blackbird, Big Star and The Publican) invited his community of chef friends to heed the call. They formed a group called Pilot Light, and cooked up some bold ideas in those early days. But it’s the chefs who were crushed when they realized the limited scope of what they could actually do in schools. That’s because CPS has a single school food contract with Aramark (six years ago it was Chartwells). But only those companies — and not some idealistic chefs — get to decide what ends up on students’ plates. So cooking for every kid was a non-starter. But the chefs were undeterred. So they started with drop-in lessons and occasional tastings at CPS’s Disney II School in Old Irving Park, where the principal was willing to give them a shot. Six years later, fellow chef Matthias Merges (of Yusho, Billy Sunday and A-10) trumpets their growth. “We have a curriculum in six schools in six distinct neighborhoods from Englewood and Logan Square to the West Side and Old Irving,” he said. But that growth is nothing compared to the leap they’ll make Thursday. That’s when an optional Pilot Light menu and curriculum will be presented in every classroom and cafeteria in the district. So what’s on the menu? The dish requires marination in a variety of spices and, for CPS lunch, the tacos will be topped with fresh cilantro and a light sprinkle of queso fresco. The al pastor taco is a product of Lebanese immigration to Puebla Mexico after the fall of the Ottoman Empire. And the chefs see that history as a rich base for lesson plans. “I want to eat that meal,” said Eva. “Food at school that’s not from the lunchroom? Yum,” said Gus. “I think I might faint,” joked Devin. Fainting is what the chefs almost did when they first calculated the logistics of pulling off this entree for 390,000 students in CPS on one day. “The important part here is that we are reaching hundreds of thousands of kids with a message that learning about food will expand your horizons and your world,” Hammel said. So will they do it again next year? “We hope that the 390,000 kids demand it!” Merges said. Eventually the chefs dream of creating a curriculum that could go nationwide. But for now, they just hope as many students and teachers as possible choose their taco. Because after Thursday, it’s back to the old lunches — with no lesson plan included.